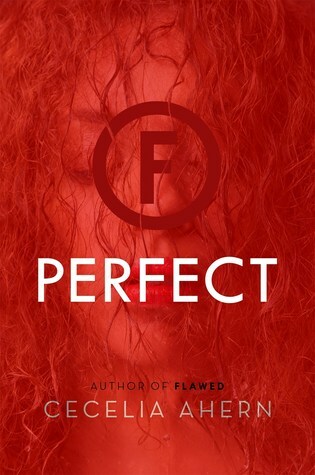 Perfect by Cecelia Ahern is the second book of her Flawed duology. 1. I both love and I am terrified by the world that Ahern creates in this series. A world where people are judged and rights are taken away from their community for making what is considered a moral mistake. People are literally branded for making a mistake in judgement. They broke no actual laws. Sometimes it is a little close to what happens in real life. 2. I was very pleased with Celestine's character development in this book. In the first book, she was a little on the whiny side, and terrified of the world after she is branded Flawed. In this book, she owns up to the role she is playing in changing the system. She learns to take her problems head on, and takes on the cause of the Flawed. 3. This book develops the character of Carrick. He was very much the mysterious boy in the first book. This book expands on him. He is definitely a brooding guy, but he truly cares for Celestine. Ahern uses him to show what growing up a child of Flawed parents is like in the government's care. Plus, he is the one that helps to motivate Celestine to help the Flawed's cause. 4. My biggest disappointment was Carrick's parents. First, I was not crazy about their personalities. Then when Ahern reveals that they were branded as Flawed for being Doctors that were anti-vaccination, I really did not like them. Importance of vaccination is a big soap box of mine. 5. I did really like the ending and how things between the Guild and the Flawed was dealt with. Plus, I thought that Celestine was incredibly smart with her plan.